I must admit that Sanshô dayû is one of the dreariest and most depressing movies I have ever seen, yet is so masterfully crafted, that it’s close to a work of art. Its message of equality for all is saturated in a tale of misery that one family endures during the Heian period in medieval Japan. The patriarch is a governor of a province and in the beginning of the film, has insulted a warlord by refusing to send peasants to his army to re-stock its numbers. It is not that he’s being disrespectful, but in his compassion for the peasantry, he realizes that by stripping the farmers from the fields, his people will starve. As retribution for his un-intended insolence, he is summarily removed from power and exiled to another province without his family. After a few years, his wife Tamaki (Kinuyo Tanaka), children and maid-servant set off to re-unite the family. The path that they must travel is a dangerous one filled with slave traders and bandits, and thus the local governor has forbidden strangers to be given lodgings. After bedding down in a clearing, they are surprised by a woman priestess who invites them to the temple where she resides. She explains that is much safer to travel by river, and offers to help the family secure a boat for the passage. The next morning the priestess walks them down to the river and they are introduced to two boatmen, who usher the mother and maid-servant into a long boat. Suddenly they push off from the shore, leaving the children behind. In panic, the maid-servant struggles with the one of the men, falls overboard and drowns. As the scene fades, the children watch as their mother is taken away and is sold into prostitution. They too are sold, but as slaves to Sansho the bailiff (Eitarô Shindô), a cruel despot who took over the province after their father was banished. When Zushio (Yoshiaki Hanayagi) and Anju (Kyôko Kagawa) first arrive at Sansho’s compound their aristocratic manner is recognized by Sansho’s compassionate son Taro (Akitake Kôno). He tells them that they must endure the hardships of being a slave until the time comes for them to make their escape. Ten years elapse and the two children have grown to adulthood. The years of toil and tribulation have not affected Anju, who still believes that the family will be re-united. On the other hand, Zushio’s soul has hardened and he now realizes that if he co-operates with Sansho’s authority, his life will be easier at the compound. After he partakes in a torturous punishment against an old man who tried to escape, his sister believes that Zushio has forgotten his father’s teachings about compassion to all man.
. 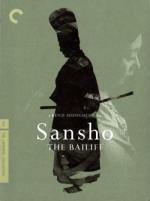 The scene shifts to Zushio at the temple and his re-acquaintance with Sansho’s son Taro, who is now a monk and helps Zushio hide from his father’s men. Taro writes a letter for Zushio explaining the circumstances by which the boy had been sold into slavery and instructs Zushio to make his way to Kyoto and present it to the deputy minister. This small synopsis truly does not do justice to an amazing and remarkable film. If you are a fan of Japanese Jidai-geki, this film will be a re-born treasure for you to discover. Kenji Mizoguchi's greatest cinematic achievements are finally beginning to see the light of day on DVD and within a few years, as more of his work is released, modern audiences will lay witness to the creative genius whose best works, rival those of Kurosawa and Ozu. I give this film my highest recommendation.